I wrote this post originally in May 2012 after we had been accepted as participants for Kentwell in their summer recreation. 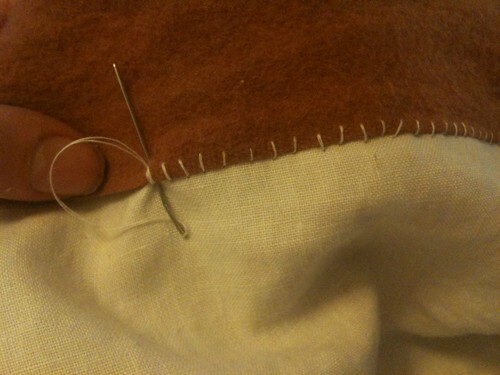 I only bought the wool after this point and had completed the linens previously. Buying wool for the novice is a bit of a minefield. Kentwell have elves you can send snippets to. I bought mine and SB’s wool from 2 different elves, BB and DH from a friend. colours, textures and weaves are all important. Bernie the bolt is a reliable seller of suitable wool. we were advised that the colour had to be on the farrow and ball chart, but browns, ochres, hint of sludgy greens should be more evident than they are. 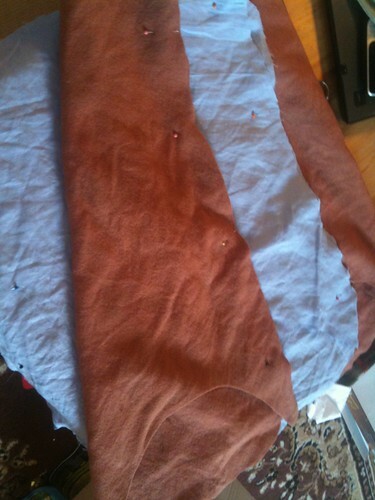 I had planned to be sludgy green or brown/russet. it didn’t happen that way! Wool is expensive, I was happy to do linens without knowing if accepted but wanted to be accepted before buying wool. 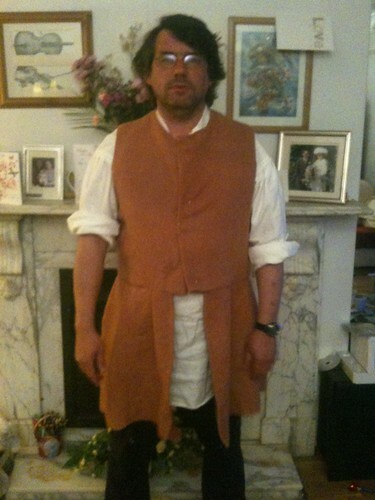 I had a lot of angst with this jerkin, having been told to make a jerkin I initially based the toile on one in a tudor tailor, but the costume elf I was communicating with said it should be sleeved, and then finally that it should be long skirted with pleats. 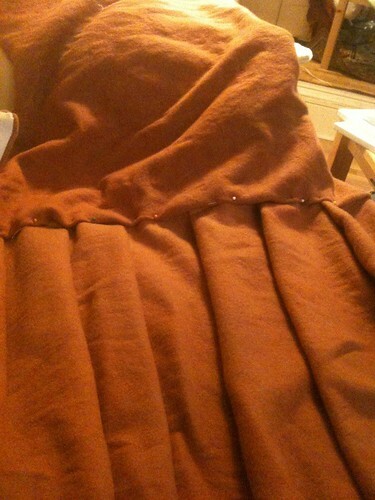 I did this, but then it was knife pleats. 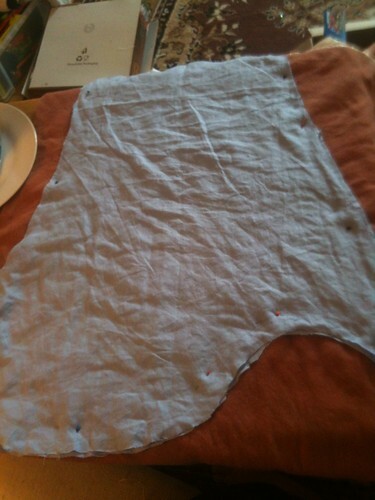 so finally we agreed a toile shape and I got going. Jerkin was my new swear word! 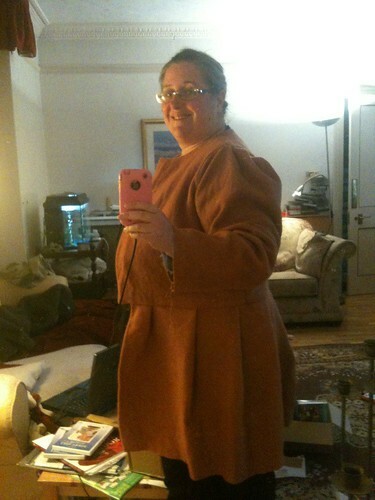 I am not entirely happy with it, think a fuller skirt and box pleats nicer, but it did pass costume check. Anyway, I should show the stages! This was one of the last things I made for 1556, as I wanted it all done by the second open day in May so I had time to put things right. i recommend for anyone else making for Kentwell, communicate with the elves and make intime for the open day. Possibly a jerkin would be a good item – at least the toile – to do at a costume making weekend that they run, as it would have been far easier to make with an elf near rather than do a bit and send a pic and wait. I a overwhelmingly indebted to the costume elf that bore with me and helped with endless photos etc. NB Anyone thinking of making clothes for re-enactment, please check with your group the ‘rules’ on materials, colours and look. different tudor years have different styles – particularly for men. following these notes does not guarentee acceptance of clothing by Kentwell or any other group, but may help a total novice such as myself. I had never made any clothes before these – a hint of my novicitude. let me just say again, this is the item of clothing I am unhappy with, and you will see why! 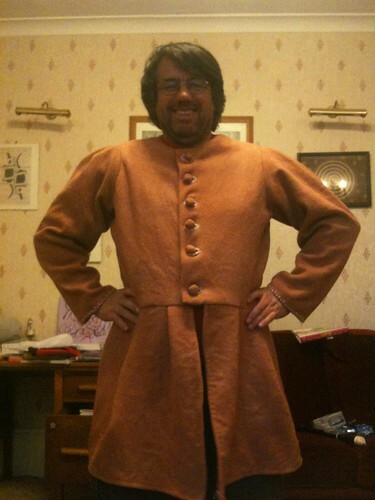 This was to be a nice warm layer, and I was short of wool, so made this out of a reasonably thick [possibly too thick] blanket which we hand dyed with terracotta and brown. i have numerous pictures of toiles, none of them right! this is the last one sent to the elf, before we worked out we were at cross purposes and life became easier, i ‘got’ what i needed to do and then got on with it! 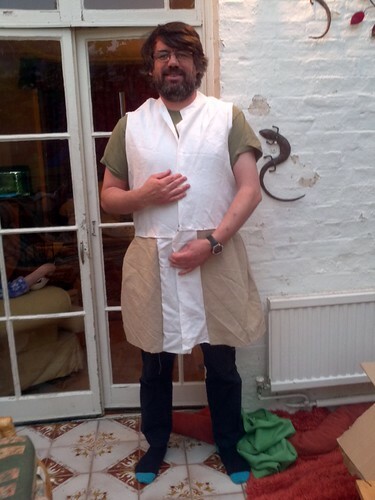 really only the body needed to have a toile, to make sure it fitted, the skirt was to work out what she wanted – ie not that! making the body part of the jerkin was then easy. 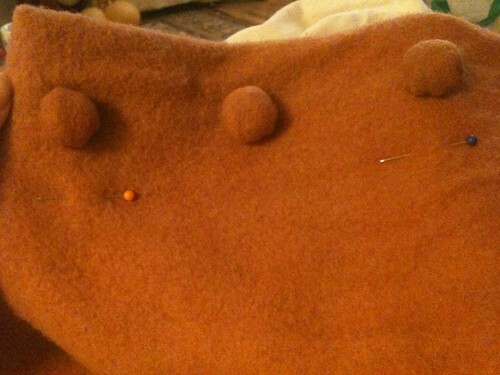 it is identical in steps to making the body of the kirtle [tho obviously not the same pattern!] 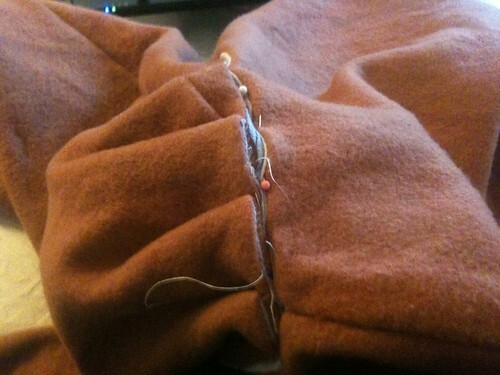 so i sewed up all the linen lining along side seam and I did the same for the wool outer. 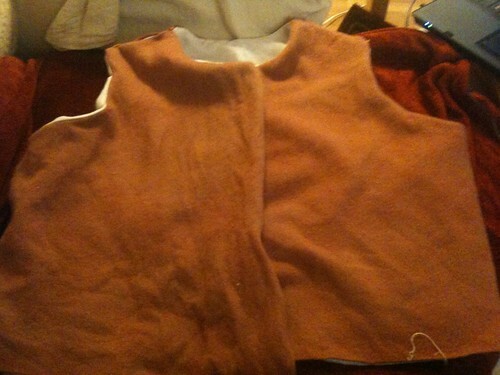 I then placed them right side to right side and sewed them together at armholes and neck holes, leaving along the bottom unsewn. 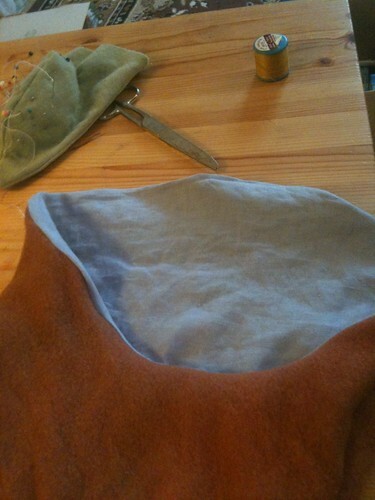 I tacked the front closed, so I could readust at the end [i am not confident enough in the toiles!] 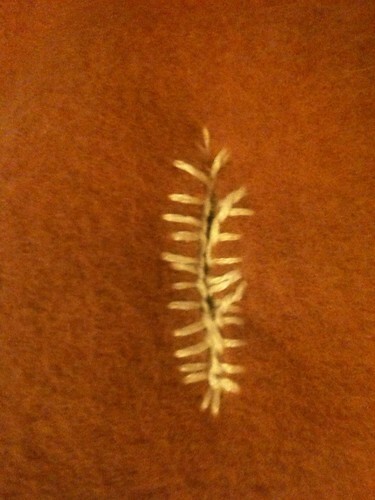 however, if you see later, I should not have sewn them together at the armhole!! 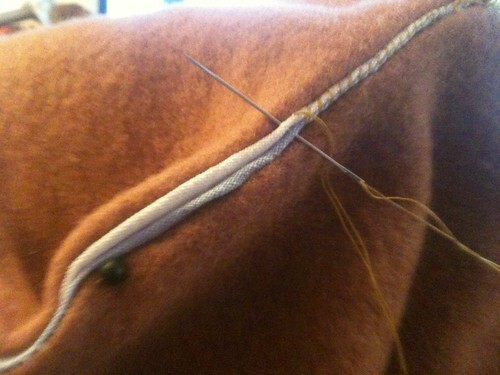 I pin the jerkin pleats onto the linen lining of the jacket just like i did the kirtle skirts – so that when you turn you have sewn to the linen lining seam allowance and turn this upwards with the wool. 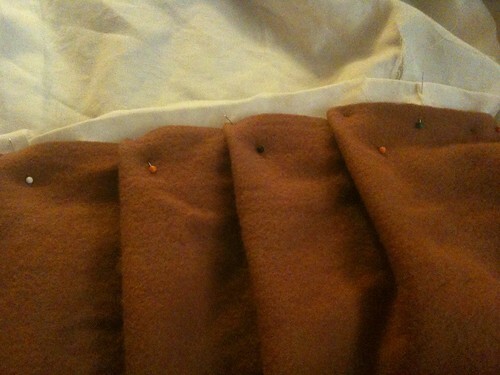 I pinned a number of times and was not entirely happy withe the pleats as the wool strip was too short. 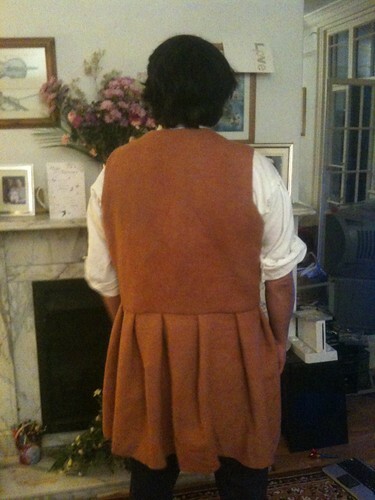 I should have cut in half at the back and placed in a panel of identical wool at this point so I could get the pleats right, but I was tired and fed up with sewing, so didn’t. wish I had! 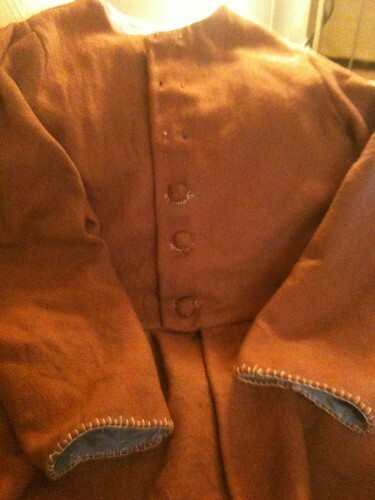 ANyway, they are knife pleated to the back with a box pleat there in the centre. 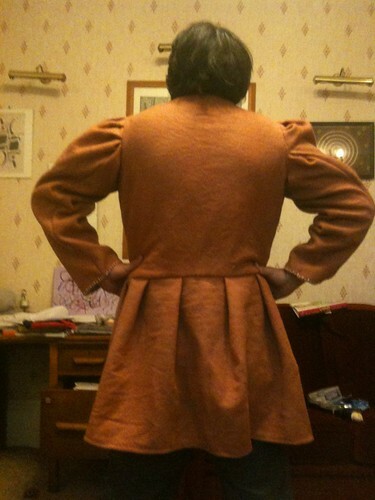 there are less pleats at the front [and i think some day i am going to have to fix this]. 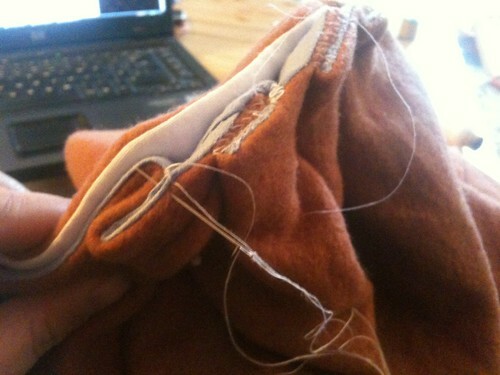 I then flipped the wool down over the top, folded under the seam allowance pinned in place and had a look. 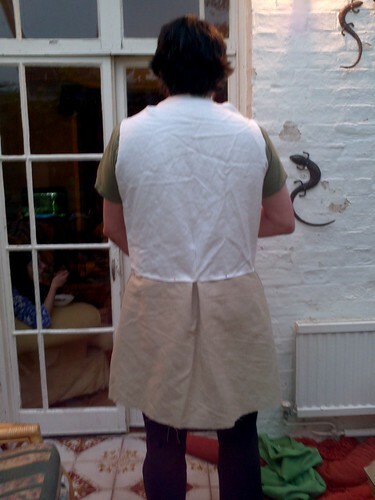 It was fine, he wore it alot all week, it looked better after an iron I think I will discuss with an elf whether to put on a black border along bottom of skirt and then at the front either side, so i can make the pleats at the front better. 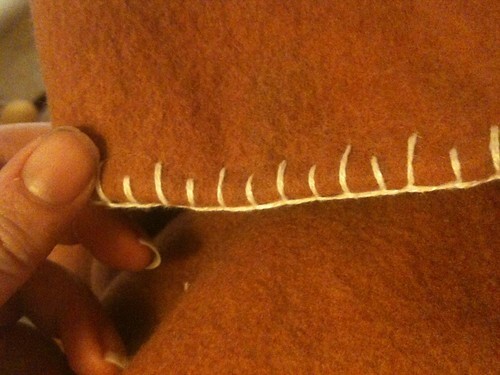 I don’t have enough material to put in a panel at the back of the skirt any more – which would be a better fix really.